Movies narrate stories that entertain us, inspire us, move us. Every once in a while, we come across a legendary tale of triumph, valor, sheer struggle and hardships, that not only gets our adrenaline pumping but also inspires us to achieve greatness. 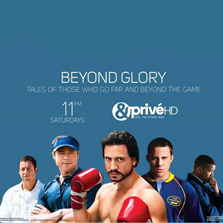 &PrivéHD, the premium destination for nuanced cinema, brings its new offering Beyond Glory that tells the tales of those who are willing to go far and beyond the game, starting April 6, every Saturday at 11PM. Beyond Glory, a two-month long movie fiesta is all set to air movies like Concussion, Moneyball, Hands of Stone, When the Games Stands Tall, Coach Carter, World's Fastest Indian, The Longest Yard and the Foxcatcher. These are stories based on the lives of athletes who share an inspiring journey of determination, passion, perseverance, and tears. While these stories tell a different tale every time, they also share a deeper understanding of what changed the lives of these sporting legends as they showcase their heartening jaunt. Studies have time and again shown that sports have a strong emotional bond with its audiences and &PrivéHD, with this property, showcases movies which make you feel the other side of that grandeur and success. Beyond Glory is all set to take you on a scintillating ride over the next two months. From a coach building a career pathway for his kids belonging to a gangster neighbourhood; to an old man fighting to get the right parts to build world's fastest bike. From mentoring the prisoners to bring out their best and changing their perception through sport; to the journey of a legendary coach taking a high school to an astounding 151 game winning streak, audiences will witness these great movies sharing the common moto of success, triumph and overcoming obstacles. The stakes are high to reach the top but then, the view from there, is breath-taking. All it takes is sheer determination, courage and hard work to go far beyond the game to achieve the pinnacle of success. Bringing some of the choicest films, dramas, news and lifestyle content for the Indian viewers, Zee Premium Cluster is truly the one-stop destination for the biggest international titles. With a powerful bouquet - Zee Prime English Pack - comprising &flix, Zee Café, LF and Wion, priced at an attractive Rs. 15/- per month, viewers are truly spoilt for choice when it comes to compelling TV series and the biggest Hollywood hits, alongside international news through Indian lens and the food and lifestyle content. That's not all! For those who appreciate content that is compelling, &PrivéHD brings riveting and award-winning films that stimulate the minds as they enthral audience. Bringing this world of nuanced cinema, Zee Prime English HD Pack comprising - &PrivéHD, Zee Café HD, &flix HD, LF HD is priced at Rs 25/- enabling more viewers to pick premium.